Aviation does not exist yet, since it is only on December 18, 1903 that the Wright brothers will make a success of their first flight. To fly is the prerogative of those which one still names the " Adventurers of the Sky ". In July of that year, a 12 year old little boy receives his first flight in Lyon. He was an immense man, an innovator, a discoverer. He gives up making career in the marine and enters the new and exciting world of aviation where, from Toulouse to Morocco, then in South America, he is one of the pioneers of prestigious Aéropostale. For me, to fly or write, it is all one. 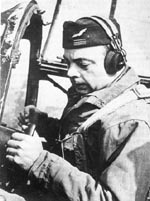 He already wrote Southern Mail (1933) and Night flight (1932) when he leaves the Company and devotes himself to writing, but in 1935, the passion of his life takes him again, he returns to piloting. The war will see him achieving 9 missions. From the 9th, he will not return. If I am shot down, I do not regret absolutely anything. who is emptied of any human substance. there, the man dies of thirst. it is absolutely necessary to speak to man. this is the modern man. Adapted from Antoine de Saint-Exupéry. "I consider that flying and writing are the same thing." to give back to human beings a spiritual meaning, spiritual concerns." Letter to General X, July 1944. Homage to Saint-Exupéry in the cultural capital of Sri Lanka, the hill capital, Kandy. Two hours of representation in a beautiful environment decorated by the colours of the Aéropostale, in order to recall the life of this exceptional man who has been able to conciliate and harmonize the art of writing and passion of adventure. The exhibition "Wind, Sand and Stars..." preludes a presentation of the Little Prince by the students of the Alliance Française, and a show displayed by Mark Amerasinghe and Valentine Basnayake (piano). 53, Rue Notre-Dame-des-Champs, 75006 Paris. tel : 01 45 44 57 34. It is one of the oldest plays in Paris with 10000 shows and more than one million spectators. 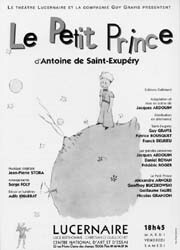 This play is directed by Jacques Ardouin and 15 adult actors and 77 children have played the three main roles : Saint-Exupéry, the Little Prince and the adults. From the North to the South, a drama group plays "Le Petit Prince" by Antoine de Saint-Exupéry on the beaches during the month of August 2001. The Company Jean Blondeau has been specially formed for this ocasion : to play under the stars, with some young professional actors, "Le Petit Prince", the most translated book in the world. 40 million $. Shooting is scheduled on summer 2001. Site of the "Society for Works and the Memory of Antoine de Saint-Exupéry".